"[Flora MacDonald is] a name that will be mentioned in history, and if courage and fidelity be virtues, mentioned with honour"
The Jacobite heroine was born on the island of South Uist in the Outer Hebrides. Four years after her father, Ranald MacDonald of Milton, passed away (1724), her mother, Marion, remarried Hugh MacDonald of Armadale, a chieftain on the Isle of Skye. Her older brother, meanwhile, remained in South Uist, having inherited his father's land. Flora's new life on the Isle of Skye was lonely at the beginning, but she was soon given companionship with four half-siblings. Nor was she isolated on the remote island: she spent six of her teenage years in Edinburgh for schooling. 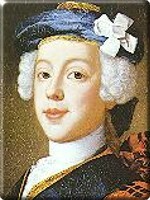 When Bonnie Prince Charlie returned to Scotland from France in August 1745, the branch of the Macdonald family to which Flora's father belonged rallied around the Jacobite cause almost to a man. Macdonald of Armadale, however, was more prudent. He foresaw from the first the failure of the enterprise, and though his heart was with the House of Stuart, he joined MacDonald of Sleat's Independent Company to fight on the side of King George. Attaining the rank of captain, he also wielded sufficient influence over Flora's brother, MacDonald of Milton, to prevent him from openly raising the Stuart standard. While the Jacobite cause was hopeful at the start, Prince Charles suffered such a terrible defeat at Culloden in April 1746 that his only resort was to regroup in the safety of France. The British government put a huge bounty on his head, and he began his perilous flight through the Isles with enemies hot on his trail. He found temporary refuge among the Clanranald of the Hebrides, but the government's persistent bands made it impossible for the Prince to remain in one place for any length of time. In mid-June his party came to Loch Boisdale on the island of South Uist in hopes of meeting Alexander MacDonald of Boisdale, only to find out that the laird had recently been arrested. By this time, fifteen government ships were patrolling the waters around the island and the country surrounding the loch was swarming with militiamen. Prince Charles spent the better part of the week hiding on the loch shore, using only his boat-sails for shelter, when, on the dawn of 21 June, a man came racing down the hill to alert the party that seven hundred men from the Baltimore were landing within one mile of the hiding place. Prince Charles fled inland with only two faithful companions, reaching a small farmhouse near Ormaclette on the west side of the island around midnight. 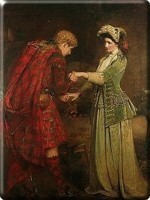 The twenty-four-year old Flora MacDonald was waiting for him. During the ten days that the small party had been in South Uist, MacDonald of Minton had been in communication with his stepfather on the neighbouring Isle of Skye. After learning about the Prince's whereabouts from his faithful attendent, Captain Felix O'Neill, the two lairds decided to use Flora to help the party escape. Flora was in South Uist visiting her brother, and so she already held a passport allowing her and her manservant to cross the strait and return to her stepfather's home in Armadale. Although Flora thought the scheme was fantastical when it was first described to her, her heart ached for the Prince's desperate plight. In order to get the party to the safety of Skye, Flora needed two additional passports. 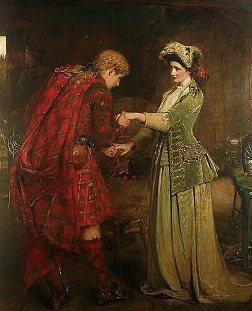 While the Prince remained hidden, Flora set out in the morning with his third companion, Neil MacEachan, to the Clanranald house in Rossinich on the adjoining island of Benbecula. As they were traveling, a patrol of soldiers detained them. This patrol, fortunately, was commanded by Flora's stepfather, who held the two overnight before releasing them with passports in the names of Neil MacEaichan, who posed as Flora's man-servant, and "Betty Burke," an Irish maidservant. Prince Charles and O'Neill met up with Flora and MacEachan at the home of Lord and Lady Clanranald on 27 June. During supper, they learned from a messenger that Campbell of Mamore was searching for the fugitives just a short distance away and had a party of 1,500 men. Upon landing on the island, Campbell had reportedly told the local chief, "Tomorrow we are going to carry out some thorough searches. If there is any contraband I think you would do well to get it under cover tonight." 1 A few days after the party escaped, Campbell arrested Lord and Lady Clanranald. Disguised as "Betty Burke," dressed in women's stockings, skirts, wig, and cap provided by Lady Clanranald, the Young Pretender headed to Skye with Flora, MacEachan, and four boatmen (he had dismissed O'Neill, who could not speak Gaelic). Flora later told James Boswell that the Prince made a rather unhandsome woman, and had great difficulty managing his petticoats. "His size was so large, and his strides so great," she said, "that some women whom they met reported that they had seen a very big woman, who looked like a man in woman's clothes, and that perhaps it was (as they expressed themselves) the Prince, after whom so much search was making." The party sheltered with Alexander MacDonald, laird of Kingsburgh, for the night, and continued on to Portee late the next day. A boat was waiting at Portee to take the Prince to Raasay, from where he would continue to France. 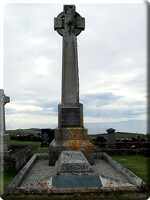 He left in the early hours of 1 July, taking leave of Flora MacDonald. Before he parted from her, he gave her a locket with his portrait inside, and promised that they would meet again someday. The Highland dance Flora MacDonald's Fancy is based on the dance that she supposedly performed for Bonnie Prince Charlie as she watched his boat sail away. Flora returned quietly home, and waited anxiously for news on the result of her efforts. She was aware, however, that she must have aroused someone's suspicion somewhere during the long journey, and she was indeed arrested by Captain Fergussone of the Furnace a couple days later. Taken aboard a warship, Flora was taken at length to Leith, where she remained for two months. Although not allowed to land, the commodore treated her with all deference her heroism had incurred, she was visited by a constant stream of Jacobite ladies. Flora was then put on board the Royal Sovereign, which took her to the infamous Tower of London. But her fame had preceded her, and the government did not deem it prudent to punish a public hero too harshly. Over the several months of her imprisonment, her cell became a kind of court, flooded with noble English Jacobites who came to visit her. Frederick, Prince of Wales, was so impressed by her high character that he not only took it upon himself to procure her liberation, but also that of MacDonald of Kingsburgh, who had been arrested shortly after taking leave of the Young Pretender. She was released when the Act of Indemnity was passed in 1747, which absolved the Jacobites of the crimes of treason they had committed during the "Forty-five," and returned to her home in Skye. 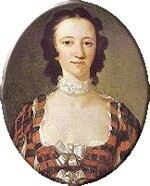 Flora married kinsman Captain Allan MacDonald of Kingsburgh in 1750, son of Alexander MacDonald. The couple lived in Flodigarry until 1772, when Alexander MacDonald died, leaving Allan as the laird of Kingsburgh. The estate, however, had been impoverished by war and crop failure, and with the Stuart cause abandoned, Flora and her husband resolved to start anew in the United States. The MacDonalds sailed with their two sons, Alexander and James, their daughter, Anne, her husband, Alexander MacLeod, and their small children, to North Carolina in 1774 on the Balloil. Flora's step-father, Hugh MacDonald, and her two half-sisters and their husbands and children had already settled in the area. The party landed at Wilmington in the fall of 1774 and settled among a substantial Scottish population on a 500 acre plantation called Killiegray in Anson County. Unfortunately, the Revolutionary War broke out before they had a chance to really settle into their new home, and the MacDonalds remained true to the Crown. In 1775, Royal North Carolina governor Josiah Martin raised a Highland regiment, in which Allan MacDonald became a captain, to fight the Patriots. Along with his son and son-in-law, Allan was one of 1,600 North Carolinian men who joined the British Army. On February 1776, the Highland regiment left camp at Fayetteville, North Carolina, to engage the Patriots at the Battle of Moore's Creek Bridge. Allan was one of seven hundred Loyalists to be taken prisoner after the prompt defeat. Eventually Allan was paroled in New York, at which point he joined a Loyalist force in Fort Windsor, Nova Scotia. Back in North Carolina, the government seized Killiegray, leaving Flora homeless and nearly penniless. After she joined her husband in Nova Scotia, he persuaded her to return home to Scotland. In 1779, Flora departed the New World on a merchant vessel, which was attacked by a French privateer on the transatlantic voyage. Ever courageous, Flora remained on deck for the ensuing melee; her bravery was rewarded with a broken arm. Following the close of the war in 1784, Allan rejoined his wife in South Uist, and the pair returned to Skye in 1787 to pass the rest of their days. Flora passed away in March 1790 at sixty-eight years of age, leaving behind five sons and two daughters. It was said that over three thousand people attended her funeral, at which three hundred gallons of whisky were consumed. 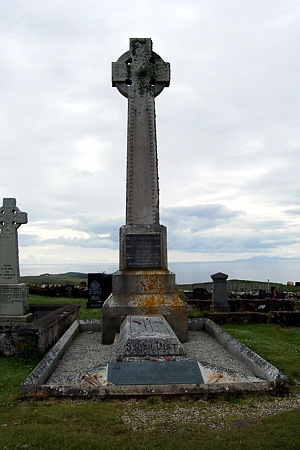 A huge Iona Cross marks her grave in the Kilmuir Kirkyard to this day. 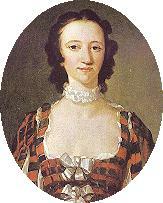 Flora, of course, died without ever meeting Bonnie Prince Charlie again. Follow they will not dare."